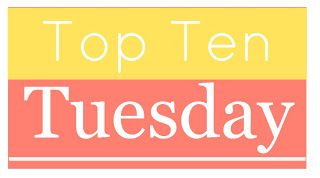 Top Ten Tuesday: It’s a New Year! I am always so excited about the new reading year. It is a strange thing because since so much of my life has been linked to school I usually view the beginning of the school year as my time to start over, what with the new books and new pencils and new paper. But, I think, because of the challenges, for books the excitement comes in January. This week Paula at The Broke and the Bookish is sharing her goals for the new year and so are a lot of other people. Swing over and take a look after you see mine. Read 75 books. I missed this goal last year by 5 books. I blame it on going back to work after a 10 year absence. Read over 25,000 pages. I missed this goal by about 3,000 pages this year. Looks like it is time to pull out some Outlanders or George R.R. Martin books. Make a dent in my TBR list, even if it is just a tiny one. Read more adult fiction, even if it is still in my favorite genres of fantasy and dystopian. Post Reviews of all my reads, even if they are short sweet and only on Goodreads. Get caught up on a few of the series I love. I am thinking particularly I want to finished Sandman (hangs head in shame) and Fables (Bill Willingham slow the hell down). Listen to more books. I need to figure out when I can fit more Dresden into my life. Participate more in online events. I love ArmchairBEA and I have eyed some other events like that but never managed to get organized to pull it off. So this year I want to add just one more. Make Thoughts on a Thursday more viable. I really love doing that piece. Memes are fun but I think overdone in the book blogging sphere. I wish more people would write about what they think about words, books and publishing in general. Comment more, Read more Blogs, Have more fun. It’s Monday: So Many Reads! I am trying to balance the two. I think that we need to see some of both. I like it when I get to know I little about a the blogger because they post some thoughts and ideas in addition to their memes. My reading goal for the year is 75 books as well! I have never tracked my pages read before but that’s a really good idea! I think I did this one year when I was on a graphic novels kick and I realize that while I read a ton of books all of them were only 144 pages most of which were pictures. I need to make a dent in my TBR pile as well, it’s gotten wild. Good luck on your goals for the year! Especially reading so many books/pages, though good job coming so close to the goal last year. Impressive! Great list! Pulling out some George R. R. Martin or Outlander is always a good idea! And I absolutely adore Fables too — waiting eagerly for the next TPB volume! I’ve been meaning to get to Sandman for a couple of years now — should have put that on my list! Good luck with your goals. I adore Sandman. I only have the last two volumes to finish but I have just not found them. Good luck to you too. Thanks and good luck to you too. Thanks for coming by.